He uses the term a lot in the memo. Now why would a memo talking about manufactured plastic objects, which if anything are helping to degrade the natural ecosystem, use a term from ecology? Why? Because we’re in the age of Media Ecology. Think of a newspaper – a physical object. It is produced by an interlinked set of operations from the manufacture of paper, to printing to the writing of what will be printed, to distribution to each individual buyer. While Media Studies may have focused what was being written in the paper and who was reading it, there is still a complex web of interactions going on. Why is Media Ecology of such interest now? When you look at a networked form of media such as a website, the complex web of interactions gets even more complex. We don’t have the paper but we do have the computer hardware and software both running the site and being used to make the site and by users to read the site. Users are not passive end-entities in this; they can be active in commenting, blogging, re-blogging, tweeting and the like. The complex web get even more, well, complex. But the relationship between the tree and those that live within its ecosystem is not always benign – its complex. 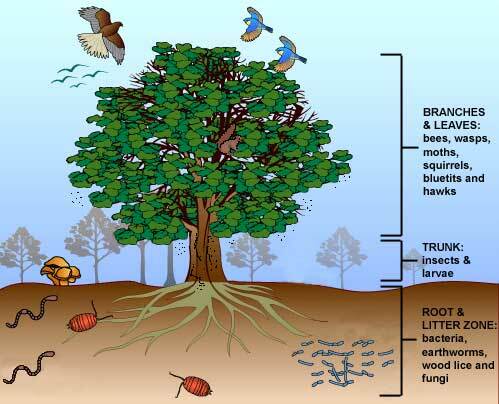 So yes the organisms that consume the dead leaves contribute nutrients to the soil the tree lives within. The squirrels disburse its acorns allowing it to spread its seed. However the shade the tree creates (and other processes in its biology) stop competitors from growing within its sphere – including competitors from its own acorns. Now Twitter. Recently Twitter made news by shutting down some 3rd-party systems. Many commentators cired foul. UberMedia, after getting its popular UberTwitter and other mobile social media apps shut down Friday by Twitter for alleged terms of service breaches, is reportedly changing its name to UberSocial as part of its effort to meet Twitter’s terms. Twitter says it suspends “hundreds of applications” that violate its privacy and other API policies, but it was the microblogging site’s suspension of the popular UberMedia UberTwitter, UberCurrent and twidroyd apps that sparked a big social media to-do.